Baseball has long been an important element of the Peanuts franchise. The 1977 tome, Sandlot Peanuts, collected nothing but baseball-related comic strips. Joe Shlabotnik rings true for anyone who’s had an affinity for a lousy player who never lived up to expectations. And as terrible as your weekend softball team might be, you can probably take solace in not being quite as hopeless as Charlie Brown’s. The first televised animated special, 1965’s A Charlie Brown Christmas, manages a quick baseball nod despite taking place in December: Charlie Brown holding a pitching stance to throw a snowball at a can. 2015’s Peanuts Movie also works in some winter ball. 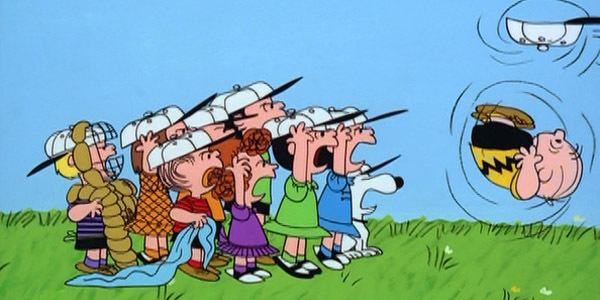 It’s Arbor Day, Charlie Brown (1976) features a tree planted on the mound. 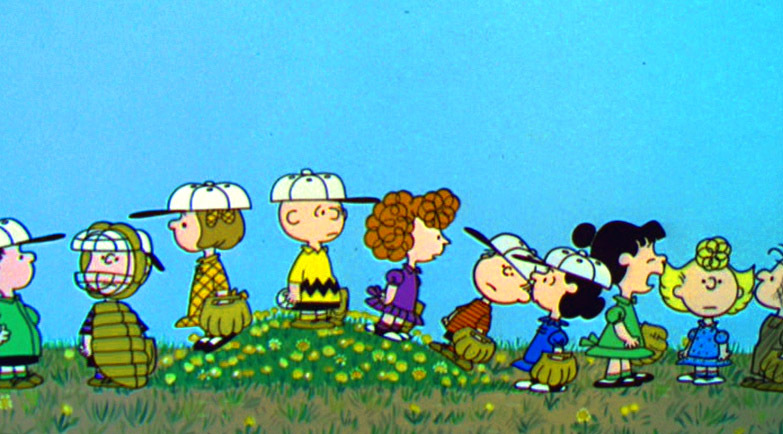 Later baseball-themed specials include It’s Spring Training, Charlie Brown (1996) and Lucy Must Be Traded, Charlie Brown (2003). But today we’ll focus on what was the second special ever produced: Charlie Brown’s All-Stars! from 1966. It’s often paired with It’s the Easter Beagle, Charlie Brown, which apparently has been shown on ABC in recent years, but it’s easy to miss compared to the essential Halloween/Christmas fare. It is, however, part of a couple different DVD releases and can be bought cheap in digital form. In the opening, we see Charlie go way, way back to try to catch a fly ball, despite being the pitcher. 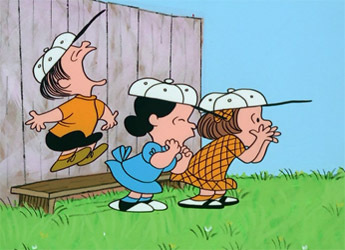 Part of the problem might be that some of his outfielders are shown playing jump rope on a sidewalk (Frieda, Patty, and Violet, who seemed to work some rotation in the OF while Lucy was a permanent fixture). After he drops it, his entire team – including the jump-ropers – surrounds him and calls him a blockhead. Charlie sheepishly walks away. Part of the team’s lack of success may be attributable to poor defensive practices, such as the pitcher being expected to catch a high infield pop-up. The resulting loss has the team questioning their desire to keep playing. In an episode full of great lines, the best one may be from the monotone Shermy, who surmises that Charlie may get “sort of a neurotic pleasure out of losing all of the time.” Shermy is shown as the team’s first baseman, although he’d pretty much disappeared from the comic strip by this time. Schulz felt the character was too bland, and he’s even reduced to the team’s DH in a 1977 Sunday comic. A despondent Charlie is shown sitting in front of a hardware store, and Snoopy insists that he write a letter of resignation. Linus emerges from the store with the news that the manager, Mr. Hennessy, has offered to sponsor the team for an actual organized league – real uniforms and everything. After a vignette involving Snoopy surfing in an inflatable pool and some great Vince Guaraldi jazz, we see a few of the boys pulling off some sweet skateboard tricks. 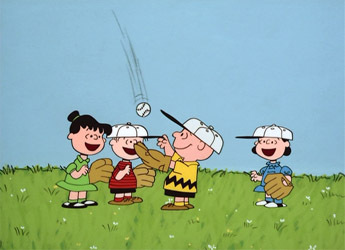 Among them is third-tier Peanuts character, “5.” He doesn’t appear to be a member of the ball club here, though he did play for them at times. He’s perhaps best remembered for having the best moves in the Charlie Brown Christmas dance scene. The boys skate through Frieda/Patty/Violet’s jump-roping session, which Charlie clumsily breaks up. One of the more endearing aspects of the earlier TV specials were the animation quirks and continuity errors, and we get a big one here. 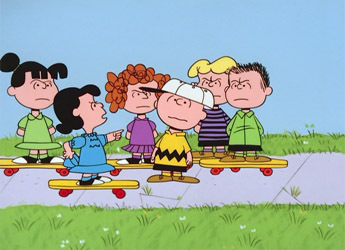 The girls chastise Charlie, but after Lucy and the boys enter the scene on skateboards, the girls who had been jump-roping earlier are suddenly on skateboards themselves, and eventually skate away with the others. Upon finally hearing of the sponsorship offer, the team agrees to keep playing, and Charlie beams with pride. The joy is short-lived after he learns from Hennessy that the league won’t allow girls (or dogs). A distraught Charlie sticks up for his teammates and declines the offer, but opts to not tell them right away. Instead, he hopes they’ll be extra-motivated for their next game by the prospect of joining a league (and getting uniforms). After we see Linus show that he’d make a terrible advance scout (“They have this loud-mouthed girl in center field who can’t catch a thing!”), the team takes the field and performs well, staying within two runs going into the 9th. 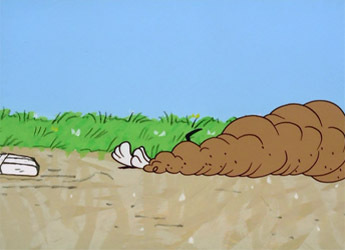 With two outs, Snoopy manages to get on before stealing 2nd, 3rd, and home, perhaps aided by the fact that no one from the other team ever appears onscreen (score it as animators’ indifference). But we do see a heretofore unseen mystery character cheer Snoopy on. He has too much hair for Linus, and isn’t wearing his signature striped red shirt. He’s not blonde enough to be Schroeder and is too clean to be Pigpen. Who is this kid? Next we see Charlie come up to bat and finally get a hit. He even manages to steal 2nd and 3rd himself. But with the team’s unidentified “best hitter” at bat, Charlie decides to steal home. Needless to say, it doesn’t work out. He has the added burden of having to admit the team won’t be in the league after all – or get those uniforms. 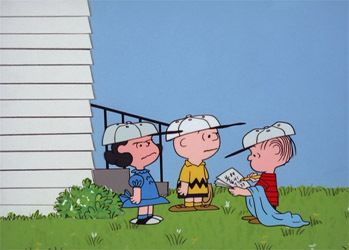 The players walk off in a huff, but learn from Linus that Charlie turned down the chance to join the league in order to keep the girls and Snoopy on the team. To make up for their guilt and to show their appreciation, they craft a uniform for their manager, whom we see laying flat on the ground while lamenting his failure. He’s touched when he sees their gift, and promises that tomorrow’s game will be different. While not quite as profound as A Charlie Brown Christmas, it’s full of great jokes and visual gags, terrific music, and quaint ’60s animation. It has obvious appeal to any fan of baseball and Peanuts, and is worth a purchase given that it’s not easily found on TV. On the 20-80 scale, this gets a solid 70. 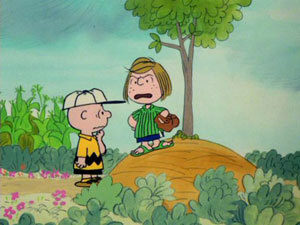 Hardball Times: Is Charlie Brown the Worst Manager Ever?